An art form without medium-specificity also means that video art will be impossible to be categorized in formalist styles or periods. However, along with its practical development it has been separated by Frank Popper into some different practical and conceptual domains as below. In reality, the price of 1000-3000USD might be reasonable for a Western artist but seems unaffordable for many Vietnamese artists who are living and working in a country where the average GDP for a person in 2010 is only 1.160 USD (the information is from electric financial website) (13). This is not to take into account the cost of other supplement device for making a video work such as computer (laptop) or professional editing sound and moving image software. In my essay “Video Art in Vietnam: A brief report” for the catalogue of the exhibition “A Video, An Art, A History”, co-organized and co-curated by Centre Pompidou, Paris and Singapore Art Museum in the this year, 2011 (14), in explaining the absence of Vietnam’s video art in the international contemporary art stages, especially in comparison with other forms of art such as performance and/or installation art, the financial reason is one of my points. It is in the circumstance of, on the one hand, in all universities in Vietnam responsible for educating art there are not any educational program designed for teaching contemporary art in general and video art in particular; on the other hand there is very few opportunities for local artists to watch good video works from international artists, - that even though since 2002-2004, in Hanoi there were some projects or workshops on video art (15), and, as mentioned above, there was a video work (by Tran Luong) was made in 1998, the emergence, both quantity and quality, of Vietnam video artists has been more than weak, both in Vietnam and in international stage. 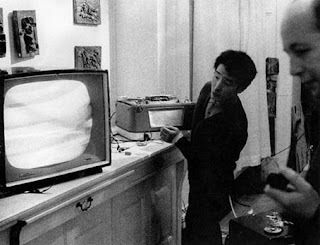 I have been obsessed with many question for a long time by this artist’s way of thinking on video art. Is the “technology” the true barrier that blocks local Vietnamese artists to make video works? On one hand, the answer could be “yes”. It is so true that in Vietnam, there is not a good “technological environment” for artists who want to work in the domain of moving images in comparison with that of Western artists. And it is even more true that in Vietnam the expectation of an artist will full education on video art in an art school is sort of impossible one. To take an example, even at present, if an artist wants to have license to exhibit her video work, s/he will face with a confusing situation of not knowing where is the exact place that her application for that license should go, either Cinema department which is responsible for giving or not giving license for all cinema products to be screened, or Culture and Sports and Tourism department, which is responsible for giving or not giving license for all artistic products to be shown. This situation signifies very well the fact that, in Vietnam now, video art has still not been accepted administratively and institutionally yet. 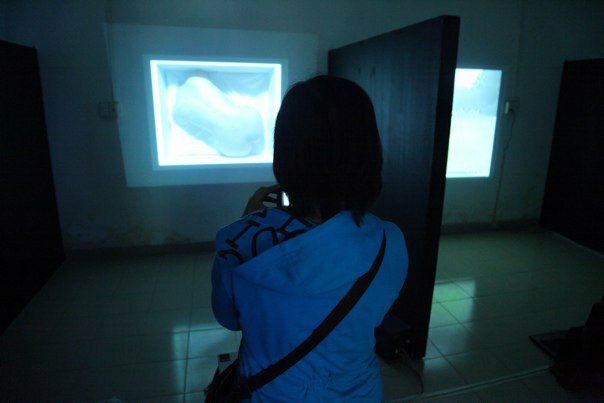 And this fact explains well the reason why, even until recent days, in all Vietnamese art universities, there has been not any official departments of video art in particular, and contemporary art in general because its essence lies at its very inter-and/or trans-discipline. However, on the other hand, the answer could be “no”. With the rapid growth of internet users in recent years [according to Asia Digital Marketing website, up to 2007, the population using internet in Vietnam went high enough to make Vietnam number 17th on the top 20 nations of highest internet users (they account for 80% of the world’s internet users) (17), and with the fact that Vietnam now (and China, of course) is still considered as one of the “heavens” for cheap DVDs of computer software, the argument that “technology” is sort of a barrier blocking video art practice of local Vietnamese artist seems not so stable. In reality, with only around 50 USD, in Vietnam, we can buy a full version of some professional computer software for editing moving images, such as Final Cut Pro (The original price of a full final cut pro software is 1700USD!). Besides, the market for used cameras or camcorders in Vietnam is more than well developed, so if not being affordable for a new camcorder, an artist could buy the used one with more acceptable prices. All these facts seem to be very convincing proofs to defend the arguments that the “technology” is the obstacle for local Vietnamese artists in working with video art. a discussion on contemporary art in general with students from Social sciences and humanity University in ZeroStation after they visit the exhibition "Videologue, a brief report on Japanese video art"
So what is the reason? 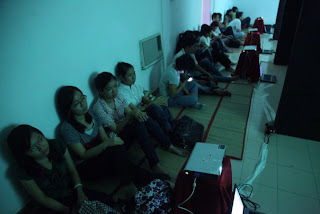 Besides other grounds such as the lack of professional screening spaces or the difficulty in having license for exhibiting video work, which I think artists can overcome by many alternative ways, I still think that the main reason for the un-readiness of local Vietnamese artists in working with video art is the lack of information about contemporary art in general and about video art in particular. Someone may ask the question that, if there is a lack of contemporary art information on the part of local Vietnamese artists, why so far there are still many of them practicing other forms of contemporary art, such as performance or installation art inside, and sometime outside Vietnam? In a sense, such questions are understandable. However, if we focus more to the essence of video art, in comparison with other art forms such as painting, sculptures, performance art, or installation art, we will find that the argument that local Vietnamese artist is in need of information is not so untrue. As having been mentioned in the first part of this essay, different with other forms of art, video art is a no-medium-specificity form of art, which locates its essence at the very concept of artists. Because of that, to “perceive/acquire” fully a video work in terms of being able acquiring and learning from it, there is only one way: to participate physically “in” its image, sound, and physical space. This, in a sense, is very similar with the highly different perceiving situations between watching movie in theater or at home with a computer. However, to me, the different perceiving situations between participating physically in a video art space with watching it in a small screen of a computer is even more extreme. For this reason, to have a general perception of a video work, one could watch it in a computer screen. However, to be able to acquire completely artistic, conceptual, and practical information of a video work, by which one can learn productively and creatively from that video work, it is no way if one can not have an opportunity to participate physically in its total space. 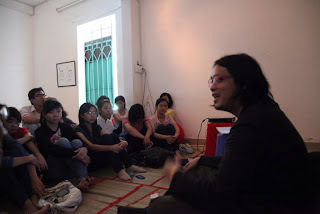 In my official art residency this year in Ruangrupa (18), a very active independent art space in Jakarta, Indonesia, I was introduced of the workshops on video art that Ruangrupa organized so far in accompanying with its biannual Jakarta International Video Festival, O.K., since 2003. In one of these international video workshops, Video Art center Tokyo participated with some video art pieces by Japanese young video artists. With this thinking in mind, I decided to ask artistic directors of Ruangrupa to borrow this series of video works to exhibit in our space, ZeroStation as a collaborating project between two spaces. It was more than lucky that artist friends running Ruangrupa, especially, Reaza, one of its artistic directors shared the same lines of thinking with me and help me very much to have these five video works exhibited in ZeroStation. I myself really hope that this exhibition with purpose to share art material with local audience and artists will be helpful, and if there is lucky enough, it could give local young artists the inspiration to make their own works. Lastly, I would love to say thanks to Japan Foundation, Center for Culture Exchanging in Vietnam for the financial sponsor for this project. (2) Quoted from Michael Rush, Video Art, p.13, Thames and Hudson, London, 2007. (3) Arthur C. Danto, After the End of Art, the pale of history, p.42, Princeton university press, princeton, New Jersey, 1997. (4), (5),(6) Iving Sandler, The art of postmodern era, from the late 1960s to the early 1990s, p.14, Westview press, United States of America, 1998). (7) Michael Rush, Video Art, p.14, Thames and Hudson, London 2007. (8) Quoted from Michael Rush, Video Art, p.16, Thames and Hudson, London, 2007. (9) Rosaline Krauss, A Voyage on the North Sea: Art in the Age of the Post-Medium Condition (1999), p.31, Thames & Hudson,London, 2000. (10) Frank Popper, Art in electric age, p.55, Thames and Hudson, United States of America, 1997. (11) Michael Rush, Video Art, p.10, Thames and Hudson, London, 2007. (12) Michael Rush, Video Art, p.7, Thames and Hudson, London, 2007. (14) from 10 June to 18 September 2011 at Singapore Museum of Art, Singapore. (15) For example the workshops between Vietnamese and Swiss artists in 2002 at Hanoi Center of Contemporary Art, or The Fairy Tales’ Soup Project, a video project organized in 2003 under the sponsor of British Council on the occasion of 30 year relation between the two nations and 10th anniversary of British Council in Vietnam. (19) There are many “sublime” video works up to now, especially those works are made by mixing video and cinema by which the boundaries between video art and cinema is broken. Typical here are Cremaster by Matthew Barney, 1999, or Zidane, a portrait of 21th century, 2006, by Douglas Gordon and Philippe Parreno where both artists used 17 professional camera to follow all moves by Zidane in all 90 minutes of the soccer game between Real Madrid and Villareal, 2005.